The Rapid 106 Stapler is perfect for print copy shops, independent publishers or in house repro facilities; combining flat stapling and saddle stapling function into one durable, automated stapling machine. Easy to set up and use, the Rapid 106 Stapler can be attached to any rigid work table and operated by switch or foot pedal. Safe and convenient to use, the Rapid 106 Stapler is both versatile and reliable. The Rapid 106 Stapler can staple 20 sheets of standard 20# bond in the saddle position, and a robust 40 sheet capacity in the flat position. Employ the use of an opto-cable to connect up to 4 adjacent units for synchronized booklet binding. The Rapid 106 Stapler comes to you with convertible table, head alignment insert, wrench, and foot pedal. Transcript: This is the Rapid 106 Electronic Stapler! It’s a desk mounted stapler best used for large productions. It uses two special staple sizes for the best results: 66/8 and 66/6 staples. The table can staple booklets, or adjust it into a standard flat position. When adjusting the table, make sure to turn the stapler off, so it doesn’t automatically staple during the changing process. Provided is a foot pedal for easy and quick stapling. Simply rotate the table into position for whichever method you need to use. Insert your booklet and push the pedal. This is the Rapid 106 Electronic Stapler! Depending on the size of stack, adjust the impact control for different pressure levels. To change the staples, open the clear cover and press on the blue lever. The staple tray should pop open a bit, then pull it all the way and insert your staples. Twist and hold the stapling depth knobs and push the triggers to the required length. When using the flat table, pushing your stack against these will automatically staple the sheets. On the table are some common measurements for aligning projects. There are also some bottom paper gauges you can shift around, and some side ones that pull out pretty far from the bottom of the table. Lastly, with multiple staplers, you can daisy chain them together in the back for synchronized stapling. You can also find replacement stapling heads, and a group stapling kit on out website. If your workplace is in need of heavy-duty electric stapler that can staple a wide variety of documents, one device you need to check out is the Rapid 106. We recently had the opportunity to try this machine out so we could fill you in on what it has to offer. Here’s what we discovered along with how we rate this product on a scale on 1 to 10. You can use the 106 to staple either flat or folded documents, such as booklets. So this device is really two staplers in once which is really convenient. The 106 has two different stapling capacities depending on the size of the staples you’re using. If you use staples with legs that are 1/4” long, you can fasten documents containing up to 20 pages. The capacity goes up when you use staples with 5/16” legs. In that case, the documents can contain as many as 40 pages. This machine comes with a foot pedal so you can keep your hands free as you’re stapling. This will give you more control over your document fastening so you’ll be able to get the results that you need. There’s also a bump switch you can use. Safety was definitely a priority when this machine was designed. It has a safety shield and the device won’t operated unless it’s in the “down” position. This feature will keep you from experiencing a painful injury. You can use the 106 in a shared work area because it operates quietly. It would be a good choice for print shops and copy rooms. This isn’t the kind of stapler you can stick in a drawer and forget about. It will require a fair amount of room so it’s not a great choice if you want something really compact. In fact, you need to attach it to the edge of a desk or table. There’s an optional stand available if you’d prefer to have a free-standing unit to keep your work surfaces clear. Finally, the 106 has a rather disappointing limited warranty. It only lasts for 90 days so it’s not the ideal machine if you really want something with a substantial warranty. Final rating: 8. Overall, we found the Rapid 106 Electric Stapler to be a pretty impressive machine. We really appreciated the two different stapling capacities (20 and 40 sheets) and that this device is able to handle both flat and folded documents. It will be really helpful if your company produces a mixture of booklets and other materialss. It’s great that the 106 can be operated one of two ways and that it even comes with a foot pedal. This device is pretty easy to use and you’ll find that the safety shield offers a good amount of protection. Just keep in mind that this device isn’t a handheld unit and that it needs to be attached to a horizontal surface. If that works for you, consider using the 106 for your stapling needs. Thank you for your question. We are able to order parts for you directly from the manufacturer. If you do not have the part numbers Rapid (General Graphic) would be able assist. Their direct dial phone number is 800-627-9140. Because parts are not able to be returned we like our customers to work directly with the manufacturer to be sure the correct part is being ordered. Some manufacturer's do not sell directly to the public. If you are not able to purchase the part directly from the manufacturer, we are able to order that for you with the part number. Give our customer service department a call at 1-800-944-4573 and we can help you get the process started. Thank you for your question. 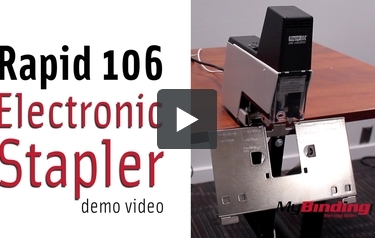 You are able to see the loading process of the Rapid 106 Electronic Stapler in the demo video on the product page. The instructions are also available in the user manual which can be found here . At what address can the Rapid 106 electric stapler be returned for repairs? If you could call us at 800-944-4573, we can see if your machine is under warranty and where you are located so we can give you the best advice for repair. We are here from 6am to 5pm PST. How many staplers(rapid 106) can I control at the same time? because I need to do 3 staples for 1 time. Is it possible to control? Thank you for your question. You would be able to set up 3 Rapid 106 Electronic Staplers in series and have them controlled through a single unit. HI there-The staples for this machine are actually not listed on our website currently but will be. The part number is 210-1-4 for the 1/4 and part number 210-5-16 for the 5/16 and come in a 5000 pack. If you need to order, please contact us at 800-944-4573 Mon-Fri 6am to 5pm PST. What staples are used in this stapler? Thank you for your question. The Rapid 106 Electronic Stapler can use the Lassco Wizer 1/4" Red Streak Staples which can be found here . Does Rapid sell a die for this machine that will do a flat staple? Thank you for your question. Unfortunately, no, the manufacturer does not have die for this machine that would allow it to do a flat staple. Thank you for the question. For parts, we would need to contact the manufacturer and get you a quote on cost and availability. To do that we would need the part number. Give our customer service department a call at 1-800-944-4573 and we can help you get the process started.